Colorado jam band Leftover Salmon will be headlining Feastival, the annual end of summer party set for August 26 in McKees Rocks. 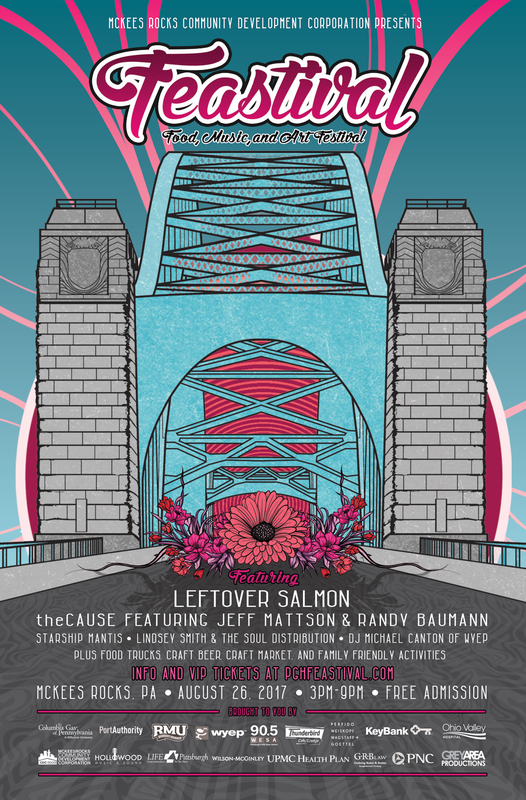 The music, food and art festival also will feature Pittsburgh Jamband theCAUSE with Jeff Mattson of Dark StarOrchestra & Randy Baumann of 102.5 WDVE, Starship Mantis, Lyndsey Smith & Soul Distribution & DJ Michael Canton from 91.3 WYEP. Created in 2013 to engage the community in the redevelopment of the downtown McKees Rocks business district by the McKees Rocks Community Development Corp., the original pop-up event drew several hundred people during its inaugural year. The event continues to grow and now attracts several thousand in part because of the stronger focus on music and winning partnerships with Thunderbird Cafe, Hollowood Music & Sound and Grey Area Productions. Leftover Salmon has established itself as one of the great purveyors of Americana music, digging deep into the well that supplies its influences; rock ‘n’ roll, folk, bluegrass, Cajun, soul, zydeco, jazz and blues. theCAUSE is a Pittsburgh-based band that combines tasty original tunes with cover versions of Grateful Dead, Phish, The Beatles, Bob Dylan songs. Founded by Pittsburgh bassist Beni Rossman, Starship Mantis combines the vocal and musical stylings of Jamiroquai with the characteristics of many other influences, both in and outside of the Funk style. Rock’N’Soul band Lyndsey Smith & Soul Distribution features a powerhouse lead vocalist and aims to create and inspire through music. The large ensemble has the ability to create soundscapes and tonal textures that provide the perfect support for Smith’s powerful vocals. In addition to this talented music lineup, the family-friendly event held in the McKees Rocks municipal parking lot will also feature food trucks, beer, clothing vendors, artisans and the Ohio Valley Hospital Kid Zone. Food truck vendors include: Miss Meatball, Pittsburgh Halal, Pittsburgh Crepes, Le’s Oriental, Happy Camper Cakes, Rogue BBQ, Chop Shop Salad Shop, Chameleon Concessions, Revival Chili, Carneval, BRGR, The Coop Chicken & Waffles, Pittsburgh Sandwich Society, Stickler’s Ice Pop, Rolling Cones and more. The event is free with online general admission registration or $5 donation at the gate. 21+ VIP tickets which includes private viewing and seating area, full-service cocktail bar, limited edition concert poster, limited VIP parking, private restroom trailer with AC, and drawings for prizes including a meeting and greet with Leftover Salmon are $75. Hours are 2:30 to 9:30 p.m., with the Ohio Valley Hospital Kid Zone operating from 3 to 7 p.m. Gates open at 2:00 p.m.